Check for contaminated materials: Properly clean and prepare the workpiece. Clean, or replace, dirty, or rusty wire. Check welding technique: Angle the gun no more than 5-15° from vertical. 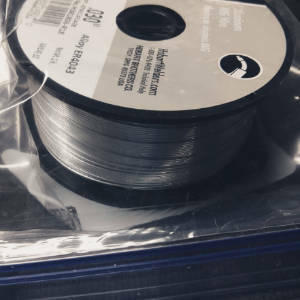 Keep stick-out at ⅜” for MIG and ½” for a flux-cored wire. Check welder settings: Use the correct polarity. Reduce wire feed speed and/or voltage. Check for equipment issues: Erratic wire feed, poor work clamp connection, insufficient shielding gas, worn or over-sized contact tip. What is MIG Welding Spatter? MIG welding spatter, sometimes called splatter, consists of molten droplets of welding material. Generated around the welding arc, some droplets are expelled outside the weld puddle. When the molten droplets land and cool, you’re left with spatter. Here’s a short, 30-second, video giving you a close-up view of a rough arc generating excessive spatter. When you can see the violent activity in the weld pool, it’s easier to understand where all that spatter comes from. When MIG welding — especially in short circuit mode — the question isn’t if you’ll get spatter, but how much. If your welding arc is stable and smooth, the beads of spatter might be so fine to be only a nuisance. But if the arc is sputtering and popping, the amount of spatter could be substantial. 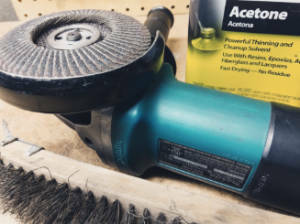 You may find BB-sized drops of spatter that you’ll need to chisel or grind off your workpiece. The spatter itself won’t affect weld integrity, unless you were to weld over it on a multi-pass joint. It’s mainly a cosmetic issue, but the root cause behind the spatter may jeopardize your weld strength. It’s easy to forget to change polarity when switching between flux-cored to solid wire. When your arc is rough, and the amount of filler material outside the weld almost equals what made it to weld bead, double-check the polarity. This happens to everyone. Incorrect polarity settings can result in excessive MIG spatter. Setting the wire feed speed too fast is a leading cause of excessive spatter. Try dialing it back a bit. Same for the voltage settings. Fine-tuning your MIG welder for a smooth, stable arc will cut the amount of welding spatter. This ability comes through experience. Overall welding experience helps, as well as time with your particular welder. You can use your welder settings chart or programs to give you a starting point. But because welding machines, materials, and conditions vary, adjustments are usually needed for the best arc. Set voltage according to the welder chart, or to where I think it should be from experience. This is a coarse adjustment that I don’t touch again unless I can’t get the arc right with the following steps. Set wire speed according to settings chart. This is a fine setting that I adjust up or down in small increments to get a smooth arc. Small adjustments prevent skipping over the sweet spot. If I’ve run through the range of wire feed speed adjustment and still can’t get a good arc, it’s time to make a coarse voltage change, either up or down. Then, return to Step 2, and repeat until the arc is stable. With a stable arc, I’ll check the weld bead for penetration. If needed, I can make small adjustments to wire feed speed or gun travel speed to get a good bead profile (an indicator of penetration) while maintaining a smooth arc. If the arc starts to sputter, while the bead still looks too cold or hot, I know that I’m out of adjustment range for the current heat (voltage) setting. So, I’ll either increase the voltage or turn it down. Then, after fine-tuning the wire feed speed, I should be ready to weld. Key for me: Making one change at a time and taking notes for future reference. When the amount of spatter varies during a weld, I’ll take a hard look at what I’m doing for operator error. Proper welding techniques can go a long way towards reducing spatter. Keeping your gun angled no more than 5-15° from vertical allows the shielding gas to blanket the weld area. It’s easy to exceed that angle when trying to keep the weld puddle in view. But too much gun angle can push gas to one side of the weld, leaving the other unprotected. Spatter and weld porosity could result. If the electrode stick-out is too long, it may jab into the weld pool causing spatter. A short arc helps reduce spatter, but if your electrode is too short, the arc may sputter. This also can disturb the weld puddle causing spatter. Yes, sputtering causes spattering. The stick-out recommendation of ⅜” for MIG, or ½” for flux-cored welding works well for me. Keeping the electrode length uniform helps me make consistent welds. Maintaining consistent form will help you to dial in your weld settings quickly. Proper base metal preparation will minimize MIG welding spatter. Rust, paint, grease, and mill-scale on your work surface will cause the arc to spit and sputter; splashing spatter out of the weld. Many people don’t like to paint, but I enjoy painting walls, doors, and even trim. What I don’t like is all the preparation needed before painting can begin. It’s the same for me with welding. But it doesn’t take long to realize that even the most skilled welder (or painter) can’t achieve the best results without a well-prepared surface. As much as I dislike all the prep work in welding, I enjoy re-dos even less. Time is wasted grinding off the lousy weld and spatter, and you end up preparing the piece just as you should have from the start. You’ll do yourself a favor by investing the time to prepare items for welding. You’ll end up saving time, and it’ll be one less thing to consider if you’re producing excessive spatter. Don’t forget to check your wire spool for contamination. Dust can collect, and rust can form on your wire. This can cause erratic feeding and weld contamination, both leading to excess spatter. You may be able to unspool the top layers to expose clean wire underneath. Some use a product to clean the wire as it feeds called Lube-Matic from Weld-Aid. I haven’t tried this yet, but some say it works on a lightly contaminated wire. Many things can go wrong with a welder resulting in poor welds with excessive spatter. The most common causes are also the easiest to correct. 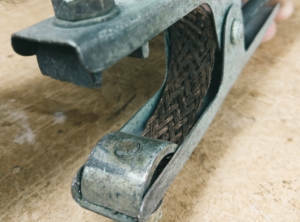 A weak work clamp connection may contribute to MIG welding spatter. 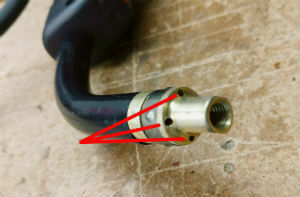 A weak connection here can cause the welding arc to fluctuate. Check that the clamp has a good bite into the workpiece or the table. Hit the contact area with a wire wheel or brush, if needed. 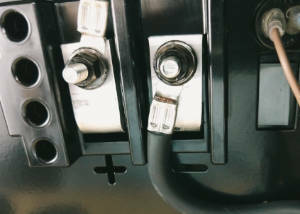 Check the clamp and machine for loose cable connections. Try attaching the clamp as close to your weld as possible. Some welder manufacturers skimp on clamp quality for homeowner MIG machines. If you think your clamp is on the flimsy side, it’s simple to upgrade to this stronger copper-cast clamp. Sturdy work clamps with a bonding cable connecting one jaw to the other are available at reasonable prices. Erratic wire feeding will mess up your welds with spatter. Check that your wire feed tension is not so loose to cause the drive roller(s) to slip. While you’re at it, check that you’ve installed the correct drive roller for the wire size. Do you see a lot of metal dust around the drive rollers or wire guide? This dust can also build up inside your cable liner. With the wire drive tensioner disengaged, the wire should easily move back and forth through the cable by hand. If not, remove the gun and use compressed air to blow out the liner towards the gun end. The liner could also be kinked and damaged. As mentioned earlier, a dirty or rusty spool of wire will feed erratically, and make a lot of spatter. Besides protecting your weld from atmospheric impurities, the MIG shielding gas helps stabilize the welding arc. So, a lack of shielding gas can result in an unstable arc and extra spatter. Excess MIG spatter can clog gas ports. First, verify that gas is reaching the gun. If you disengage the wire feed tensioner and pull the trigger, you should hear the gas flowing from the nozzle. If not, check, and if needed, adjust the gas regulator and make sure the gas valve is working. Also, check gas lines and fittings, including the connections inside your welder. 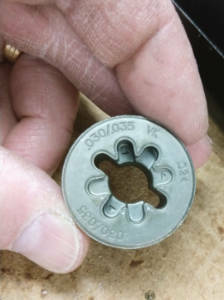 These may use spring clips over tubing that could become disconnected. Spatter can build up inside the gun nozzle and restrict gas flow. Clean or replace. If you weld with flux-cored wire without a nozzle, or using a MIG nozzle, spatter may reach and cover the gas ports. Clean, or replace, the contact tip adapter. Flux-cored nozzles that protect the gas ports from the spatter are available for many guns. Protect the welding area from breezes that can dissipate your shielding gas. Reposition fans or hang welding blankets or curtains to block air flow. When added to Argon welding gas, CO2 (2-25%) stabilizes the welding arc and reduces spatter. Although cheaper, using 100% CO2 results in more spatter than the traditional C25 MIG mix of 75% Argon and 25% CO2. I have never worn out a contact tip, but I see how this can happen. The thin, steel wire is harder than copper and acts as a fine saw blade. Ever notice the sawtooth-like impressions left by a knurled flux-core roller? Higher welding temperatures only enhance the cutting effect. Bernard has more information about contact tip wear. Now, this is something I have done. With different sized contact tips all looking the same, and the markings hard to read, it’s easy to install the wrong tip. My favorite: Using a .035” instead of a .030″ tip. With too large an opening, the wire electrode can lose contact with the tip, causing the arc to sputter. Replace if the wire passage looks oval instead of round, or if it’s the wrong size for the wire. An easy fix. While these products don’t reduce spatter, a light coating of welding anti-spatter spray or my favorite nozzle gel can keep the spatter from sticking. Makes for easier cleanup of your gun and base metals. 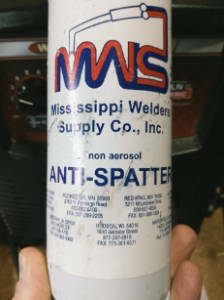 Anti-spatter spray doesn’t reduce MIG spatter but makes clean-up easier. MIG machines do make the best welders for beginners, and the occasional home welder. But it does take some practice to master the basics. As you gain more welding experience, you’ll get to know your MIG welder better. Machine setup for your projects will become second nature. Your skills with the MIG gun will improve, as will your ability to prepare your workpiece. With time, you’ll overcome most causes of excessive MIG welding spatter. Then, better-looking welds will become the norm, rather than the exception.